Fuel tanker drivers have voted in favour of taking strike action in a row over terms and conditions and safety, the Unite union has said. The government is holding a meeting with fuel delivery companies and supermarkets to plan tactics for coping with any resulting strike. 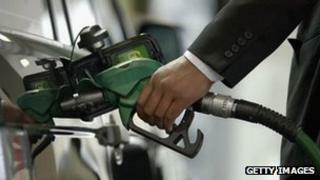 Army drivers are being trained to deliver fuel to petrol stations in case of a walkout by tanker drivers. Unite said there had been "unrelenting attacks" on drivers' conditions. In an interview with the BBC's Hardtalk programme, the general secretary of Unite, Len McCluskey, refused to rule out the possibility that any strike would be held over Easter. About 2,000 drivers at seven distribution depots took part in the ballot in what was the first national industrial action campaign for more than 10 years. Unite said five of the seven depots backed strike action, while two did not. Of those five, the vote in favour was 69%. Turnouts across the five averaged 77.7%. A statement from Unite said: "Tanker drivers work in an increasingly fragmented and pressurised industry, where corners are being cut on safety and training in a bid to squeeze profits and win contracts. "Drivers face growing job insecurity as a result of the contract 'merry-go-round' and a 'beat the clock' culture has flourished, with drivers forced to meet ever shorter delivery deadlines. " It added that pensions were also inferior to those previously offered and some workers had switched pensions six times. The CBI employers' group said that disruption on the roads was in nobody's interest. "Drivers have voted for a strike, but each employer and Unite should now get back around the table to discuss the issues raised. Going ahead with strike action would have a real impact on people across the country," said John Cridland, CBI director general. One of the companies involved, Hoyer, said its safety standards were very high. A Hoyer spokesman said: "Hoyer has one of the highest health, safety and training standards in the petroleum distribution sector." The firm said that pay and conditions for Hoyer drivers were among "the best in the industry", adding that the company's drivers earned on average £45,000 a year. Hoyer said Unite had walked away from discussions designed to settle the dispute. The UK has 7,900 petrol stations. Widespread protests against fuel prices in 2000 caused disruption across the UK. Cabinet Office minister Francis Maude said the government had "learnt the lessons" of the past and stood "ready to act" in case of a walkout. Mr McCluskey said: "For over a year we've been desperately trying to bring about some stability in the sector and urging government ministers to persuade contractors and oil companies to engage in meaningful discussions with us." Ministers say the training of army drivers will begin next week as part of contingency plans being drawn up to avoid major disruption to fuel supplies. Mr Maude said: "We are calling on the trade union Unite and the employers involved to work together to reach an agreement that will avert industrial action," he said. "Widespread strike action affecting fuel supply at our supermarkets, garages and airports could cause disruption across the country. "The general public should not and must not suffer from this dispute, and strike action is manifestly not the answer."